The Rolleicord line is the cheaper little-brother to the famed Rolleiflex. The Rolleicords, as I understand, were built similarly to the Rolleiflex, but with not quite as good of lens, not quite as fast of lens, knob winding instead of the Rolleiflex’s lever-wind, and a few less features (for instance, no double-exposure prevention mechanism on my Rolleicord). They also sell these days for a fraction of the price of a Rolleiflex, so I think they’re a good buy. The image quality I’ve gotten from it is great. The lens is quite sharp corner-to-corner, with no apparent vignetting at all. While I won’t argue with anyone who tells me a Rolleiflex is worth the price, I’m very happy with this camera. An f/2.8 lens that might be standard on a Rolleiflex would certainly be a step up, but besides that, I don’t see much that I’d prefer in a ‘flex. I don’t at all mind the knob crank instead of the lever on a ‘flex. Using a TLR camera is all about moving slowly for me, so I don’t care if I could wind it faster with a lever. I do like the auto-stop winding, so that I don’t have to look at a red window on back to carefully wind to the right spot, like I do on my other TLR cameras. Just push the button in the center of the wind knob and wind ’til it stops, and you’re ready for your next shot. There’s no double-exposure prevention, but that hasn’t tripped me up yet – I just always try to remember to wind it right after I shoot. The build of this camera feels solid and high-quality, but not too big and heavy. Already older than me, I get the feeling that this camera will be functioning smoothly far past my lifetime. My only minor complaint is that the viewfinder is kind of dim. This is a common complaint about Rolleis. Someday I might try one of these replacement screens for the viewfinder. hood and ground glass removed, cleaned and replaced. I don’t remember what I used to clean the fungus from the lens element, but it worked, and the fungus hasn’t returned many years later. leatherette removed, screws can be cleaned off. As long as the screws were now accessible, I thought I may as well take the side panel off and see how the focusing mechanism works. Very interesting, and well made! How do you like this compared to the Super Ricohflex? Quality seems better, but is the Super Ricohflex comparable enough? It’s just such a steal and so much cheaper, I’m considering getting the Super Ricohflex, but it’s almost too cheap in price compared that it seems like it would be a toy. They are very different cameras, but they both are capable of taking great photos. The Rolleicord has a much higher-quality build (solid cast aluminum body compared to bent/stamped sheet metal body, etc), and some nice features that make it easier to shoot. But the Super Ricohflex is certainly capable, and is a fun and cheap way to try out a TLR camera. It is very simple in design, which makes it easy to take apart and clean and fix, if needed, whereas the Rolleicord is much more complex to repair. The lens quality is probably much better on the Rollei, but I think the Ricoh is pretty good. See the link to Mark Hansen’s site at the bottom of my Super Ricohflex page — he likes the Ricohflexes a lot. When I shoot the Rollei I feel much more confident in the image quality, while the Ricoh makes me feel a little less certain, but that can be fun, too. The Rollei is easier to shoot because of the auto-stop film winder (on the Ricoh you have to watch the red window on back for the next frame number on the film), and the focus knob on the right side of the camera is a little easier than focusing by turning the front lens element. If you can find a good deal on a Super Ricohflex, I’d give it a try — you’re not out to lose much, because they’re pretty cheap. A common problem to look for is that the grease in the lens focusing gears gets hardened and you can’t turn the lens elements to focus. It can be fixed, but takes some work. Also, the Ricohflex is smaller and lighter, which is kind of nice when carrying it around. Found your blog while searching for the Cord III. I have just recently got one, checked on the aperture and i like that it is rounded all throughout the aperture range unlike my other Rolleicord Va. I got a Rolleicord III from my uncle the other day. Love it, but I just had a quick question. I’ve been using the light meter in my 35mm Canon AE-1P as an exposure meter for the Rollei. Will that work, or do you think I would get the exposure incorrect? Right now what I’m doing is mounting a 50mm f/1.8 on my AE-1P, setting the aperture to f/3.5 (or whatever f-stop I’m aiming for on the Rollei), adjusting the ISO on my SLR to match the speed of the film I’m shooting on, and then metering the light so I can pick a shutter speed. I haven’t developed anything yet, as I’m on my fifth shot of my first roll. Is this ok, or am I killing my chances of getting good pictures? Thanks for the time. I’m loving the blog! Hi David. Thanks for reading my blog. I think you have a good system going there for metering. As long as your Rolleicord’s shutter speeds are relatively accurate (and they most likely are), the settings should be exactly the same regardless of what camera you’re using. If your ISO/aperture/shutter combination are the same, the exposures should be the same no matter what camera it is. A handheld lightmeter would be a little more convenient than carrying two cameras, but the results should be the same. It’s a good use of the equipment you’ve got. Enjoy using the camera, and let me know how it turns out. Thanks, Kate!! Enjoy the Rolleicord. I got the same. I find the it a very good TLR. I was clearing out some old stuff and came upon an old Rolleicord 111 which I thought might be worth putting on ebay, started some research and found your site, love your work and now inspired to clean up the camera and see what it will do. I learnt photography with film and now shoot digital but agree with you, they are different, not necessarliy better or worse. Your photographs also support the old saying that it’s the eye not the camera that is important. I like to ask people whether they ask the chef what pans he uses if they enjoy a meal! Good work, thanks again, though I’m not too sure as the sale proceeds, if any, were going into the boat fund! Thanks for your comment. I’m glad I could inspire you to give your Rolleicord a try. I wouldn’t fault you for selling it, but you may as well try it out and see how you like using it. Anyway — if you end up using it for a bit, then sell it on ebay you should be able to get a little more money for it because you’d know if it works properly. Then you might have a few extra dollars in your boat fund. Thanks for visiting, and enjoy shooting the Rolleicord. Let me know if you have any questions. Thanks Charlie. I’m not sure which photo you’re asking about. I’ve also just recently bought a Rolleicord K3B. My film and camera should be arriving this week. I’m anxious to try it out. I enjoy your blog very much. Great photos. Thanks, Gary. I hope you enjoy your new camera. Well, I’ve learned a valuable lesson. Take eBay camera descriptions with a grain of salt. Now I’m eagerly awaiting the arrival of my $50 Accuraflex TLR………from eBay. I won’t be joining the Rollei crowd. Bummer. I’ve had some bad luck with ebay sellers too. I hope you were able to get your money back. I’ll be interested to hear about the Accuraflex. Hello Rich, Is it normal for the rear cover to come off when opening to load a new roll of film? Every time I fully open the rear cover, it comes dis-lodged from its locating pins. Also, there is a long spindle with a set of gears on it behind the upper section (behind the spool where the film loads). What is this for and why does it sit at an angle? The gears don’t appear to engage with anything. Just wondering. This is my first TLR so I’m learning the ins and outs. I’ll let you know how the images come out after receiving them back from processing. Thanks so much. Hi RG. No, the rear cover shouldn’t come all the way off. Perhaps those metal tabs that the pins fit in are bent outward away from the camera body? There should be a small screw on each holding it to the body less than a centimeter forward of the door pin. If those screws are loose, then the metal tab can be pulled away from the body, and the spring released from the door. As long as it stays firmly in place when it’s closed, it shouldn’t matter too much. Yes, that spindle with the gear is supposed to sit at an angle — you should be able to push the toothed gear side of it toward the front of the camera and spring tension should push it back toward you. I think the toothed part of that spindle presses against the paper backing of your film as it winds on, and I believe it drives the frame counter. Good luck! Hi Rich. Yes it was a loose screw for the one metal tab. Easily tightened. And I see now how the frame counter works. Although the frame numbers are not centered in the window, but that isn’t a big deal. Thanks so much. Hi Rick, My first roll with the Rolleicord III came back and I’m hooked. The image quality is not what I was prepared for, quite frankly. Its hard to describe. There’s an analog quality to it that’s similar to listening to a Stereo LP on a good belt drive turntable. I have another question that involves resurrecting my darkroom. I’ve owned a Beseler 23CII enlarger since the early 80’s and I want to start printing 6×6 negs. According to the info from the enlarger, it supports 6×6 film (by adjusting the diffuser), but what about the lens? I currently have a el-Nikkor 50mm for my 35mm days, but I would assume I need something in the 75-80mm range? Awesome! Glad to hear it turned out well, and that you’re hooked. Who developed and scanned the film for you? I’ve never printed medium-format film in a darkroom, only 35mm, so I don’t know much about it. I suppose you probably need a different lens. Do you have a 6×6 film carrier for the enlarger? If so I’d stick some film in there and see what that lens does. The “bellows” box is slightly out of alignment. Closes properly at the top, but, about 1/16 inch open at the bottom. Are their some DIY guides to repair this. Due to the cost of this one, I’m willing to tackle the job. I use Camera Service Co. and Harry Fleenor when I need to. Thanks in advance. The CD is a great reference for a lot of camera repairs. I’ll update my post above with some photos I took when I did some minor disassembly — they might help you a little bit. thanks a lot for sharing these images and the info, it’s appreciated! Have recently been given on of these Rolleicords.. very curious how shots will turn out! Also thanks for sharing your camera-scanning-setup. Have a good one and cheers from Berlin! Thanks, Tina. Good luck with your new Rolleicord. I have been loaned a Rolliecord which I am excited about. Having carefully read the manual I loaded a film but now find the shutter lever appears to be jammed, it won’t move. Any suggestions as to the cause of this problem and hopefully the solution? I havw a II(d) with a Triotar lens. It is my go-to camera for portaiture. The “softness” of the Triotar gives a better look for people in natural lighting. A few words of advice from Great Britain: The Rolleiflex was bought and used by professional photographers who put more rolls through it in a week than most amateurs used in a year. Plus, they did not bother with the substantial leather case as it would have slowed up their workflow substantially. The Rolleiflexes on the market today are mostly very badly worn and downright shabby, plus without a case. A good buy at £450-£599 and more? No, certainly not. (prices taken from Ffordes of Inverness a few minutes ago. 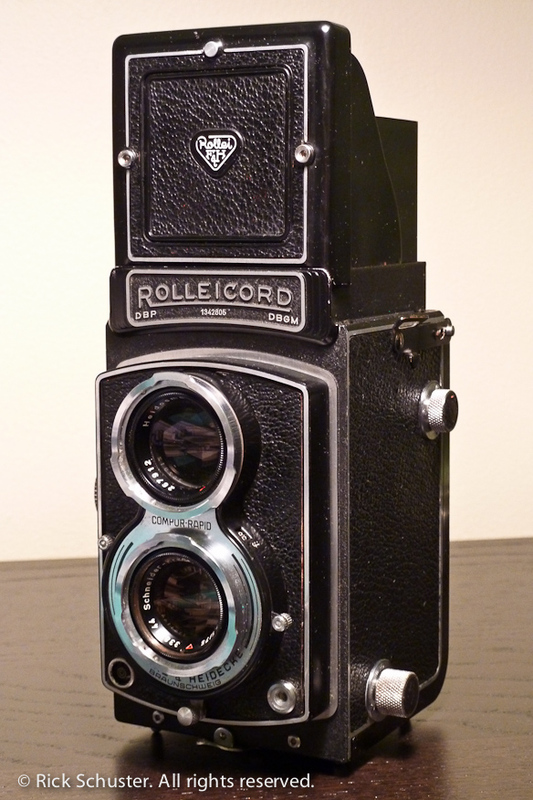 Now the Rolleicord was bought by amateurs who saved long and hard for it. They saved further for the leather case with strap. They treated it kindly and cosseted it as it had cost as much as a secondhand car. Plus the had to buy a meter for it, most probably a Weston Master, say a 11 or a 111. Then there was the cost of films and processing and the cost of going to nice places to take his shots. This is why I am going to say that, on the used market the Rolleicord is a far far better buy that the more expensive Rolleiflex. The earlier models, before the 111 used the 3 element Triotar lens. This was slightly inferior to the Rolleiflex lens. However, people who concentrate on portraiture have discovered the Rolleicord with Triotar lens and are rapidly snapping them up. They don’t want the 111, IV. Or V with the Xenar lens (a Tessar type) as its too sharp for them. Me? I bought a Rolleicord IV from Ffordes a few years ago for £79 plus carriage. Beautiful condition, even the leather case. I buffed the case up with wax polish and it gleams. It came with a lens hood in its own leather case. Inside the camera case, written in biro is a name and address in Florida? My Rolleicord is better travelled than me. The results (on Ilford FP4 are simply stunning from the Xenar lens using the lens hood. The hood on the camera converts to an open frame one for following action and also has a magnifying glass for the ground glass screen. I find using a cable release easier than moving the little lever under the taking lens. Hello, do you have any idea what you used to clean the lens. I’m working on a rolleicord IV atm and need to clean the lens from fungus. I might change the focusing screen as well but will see. I can allways clean it from dust while i’m working on it. Maybe that optic clean that you have in an image above. Apparently hydrogen peroxide mixed with ammonia works well, or vinegar mixed with water. I don’t recall what I used. I may have used vinegar and water, or I may have just washed it with dish soap and water, then maybe a lens cleaner such as that Optic Clean in the photo.